So here’s the question: Is Dark Shadows cursed? Over the last couple years on this blog, I’ve watched and read and listened to a growing number of Dark Shadows spinoff products — the 1991 revival series, the Gold Key comics, the Paperback Library novels, the trading cards, and the Big Finish audio dramas — and they all have one thing in common, namely: They don’t make any goddamn sense. And we haven’t even gotten to Night of Dark Shadows yet, one of the outstanding leaders in the field. It seems like people are unable to write Dark Shadows stories that hang together in a coherent way, up to and including the writers of Dark Shadows. So what kind of chance does the Dark Shadows comic strip have? For these two weeks, while I’m out traveling, we’ve been reading this 1971 strip, and so far, it looks like the curse of not making sense is in full effect. So as we go along today, I’m going to periodically check in with the ABC7 AccuWeather Sense Tracker, to see if we can figure out what’s wrong with the structure of Dark Shadows stories. 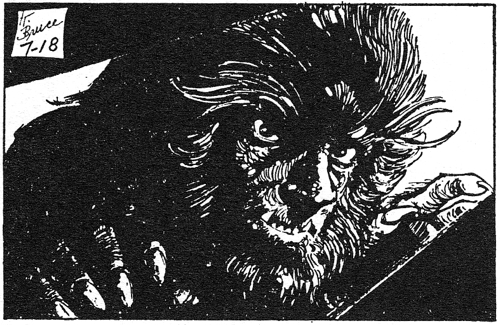 The story begins, as many do, with a werewolf kill. This time, it’s a generic “elderly resident of Collinsport,” a one-panel nameless redshirt. So we’ve got a problem already, sense-wise, because how could somebody get to be this old in Collinsport, if they walk around in these woods without a cross, a pentagram, a Patronus charm, a rocket launcher and a hall pass? Now, the interesting thing here is that this pre-credits death scene is perfect for 1971 — but not 1971 Dark Shadows. As a soap opera, Dark Shadows invests quite a bit in building up the cast, and they don’t have a lot of money to throw away on hiring somebody who’s going to die at the end of a single scene. Yes, they occasionally bring in a doomed prostitute once in a while, but that’s a different scene structure, in the middle of the story. They don’t do openers like this. What this actually reminds me of is 1971 Doctor Who, during the Third Doctor’s era. There’s a hard and fast rule that any character walking around alone in the first few minutes of a Pertwee story is about to get killed by a Monster Point of View shot. There’s Pigbin Josh, and Mr. Ollis, and the guy from the beginning of The Daemons whose name I forget, because he dies too fast for anyone to remember that he even existed. This story is actually structured like a Pertwee Doctor Who story, with Elizabeth and Carolyn filling in for Jo Grant and the Brigadier. Some ham-fisted bun vendor’s been reversing the polarity again. After the opening appetizer murder, Barnabas talks things over with his companions. There’s a monster attacking people in the woods, or near the base, or on the oil platform or whatever, and UNIT is baffled. 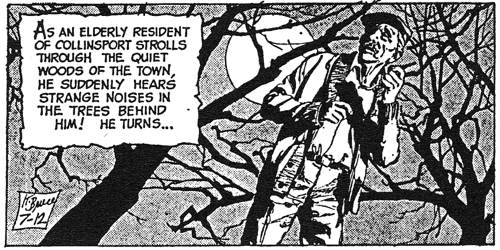 In a real Doctor Who story, there’d be twenty-five minutes of driving around and talking to stuffed-shirt bureaucrats before you get to see the monster, but the Dark Shadows comic strip doesn’t have that kind of time, so Barnabas’ magical plot-sensing abilities kick in. “All my instincts tell me… it wasn’t a wolf! No… It was another kind of creature!” He’s always doing this. Nobody in the comic strip ever finds out information by actually finding out the information. So the vampire runs out into the woods and yells at everything. Standing on a hillock, he shouts, “Do you want another victim? I am here! I am waiting… werewolf!” The wolf doesn’t take the bait. Barnabas continues to trash-talk, for a couple days. “Are you afraid? Do you fear me? Why do you hesitate?” The idea that maybe the werewolf has other things on its mind does not seem to occur to Barnabas. By the way, I really haven’t said enough about the art on this strip, which is excellent — especially these big werewolf close-ups, which are clearly based on photo reference of Alex Stevens in his wolf makeup. The artist, Ken Bald, took a lot of time on these panels, as he does with all of the backgrounds and props and architecture, and I for one think it was time well spent. Barnabas strikes out on the monster-wrangling, so Carolyn steps in to help introduce the supporting cast. She’s got a volunteer job at the library, helping out the new librarian, Erik Fabian. He just started a few weeks ago and needs a great deal of help shuffling books around, so that’s what Carolyn is doing with her evenings lately. And it’s no wonder that Erik’s work is piling up, because he spends all of his time searching through the library’s collection of books on voodoo and black magic, and in this town, that’s pretty much all they have. 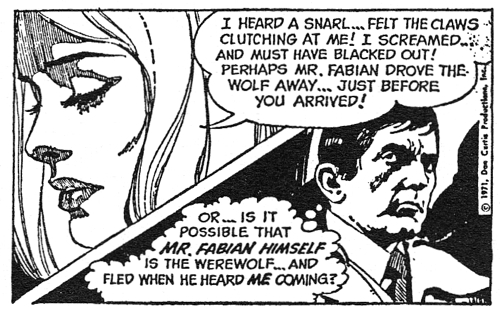 Then we’re introduced to Erik’s wife, Azrael Fabian, who’s the werewolf in this story. I’m telling you this because the writer is trying to pull some kind of Scooby-Doo maneuver, where you’re supposed to be thinking that the werewolf is Erik the whole time, and then it’s a huge shock when they announce that it’s actually Azrael, which you figured out two weeks earlier. I have no desire to participate in this transparent charade. On being introduced to Azrael, Carolyn thinks, “She has the saddest eyes I’ve ever seen!” which I wish she’d said out loud, just to see if it would make her even sadder. But Azrael has a good reason to look sad, because she only gets to speak three times in this entire two-month story. She says her first line, “Where’s Glenda?” three weeks from now, and then four weeks after that, she gets two more lines: “W-what happened?” and “Let me die to pay for my crimes!” At that point, the only way to shut the little chatterbox up is to finish the story, and send her away to wherever silent sad-eyed people go. Now we’ve got a cast, more or less, so it’s time to get the story moving. 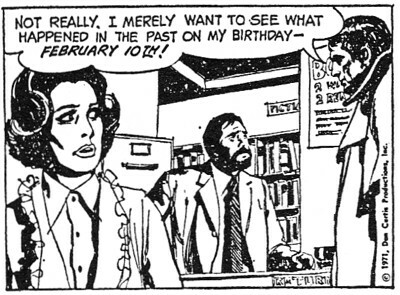 Carolyn starts leafing through a book about horoscopes, and she casually mentions that her birthday is February 10th, which appears to shock the Fabians out of a year’s growth. Threat-level wise, this piece of information is a solid green, and their response is orange-to-red. I guess they don’t like Aquarians. Then we jump straight from Doctor Who into Paperback Library territory. Erik takes Carolyn back home, walking through the spooky woods that are so obviously unwise to walk through. In the forest, Erik says that he hears a noise, and then he suddenly darts away, into the underbrush. 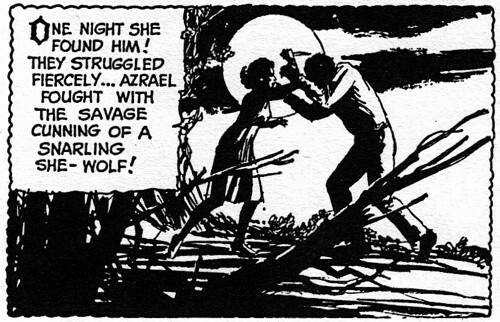 A moment later, the werewolf appears, and attacks Carolyn. Luckily, Barnabas — also walking through the woods, for some reason — hears her screaming, and rushes to her aid. Don’t worry, she’s fine; everybody’s always fine in this comic strip. This is a monster-themed kids’ adventure story for a daily newspaper, so nobody dies; they just get the wind knocked out of them for a second. The elderly resident didn’t die, either. He’s fine, everyone is fine, people are immortal. Carolyn isn’t even bruised. This plot point is actually in one of Paperback Library’s Dark Shadows romance novels — Barnabas Collins and Quentin’s Demon, which we talked about a few months ago. In that story, when Quentin and the heroine, Lara, were out on the lawn, he suddenly dashed away, and then she was mildly attacked. Barnabas helped to chase the monster away, and everybody lived happily ever after. 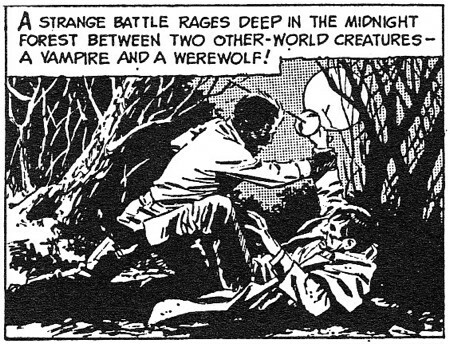 As part of that sequence in Quentin’s Demon, the wolf man’s front paw is injured, and they make a big deal about Quentin’s hand being wounded in the morning. That happens in this comic strip story too, a little later on. 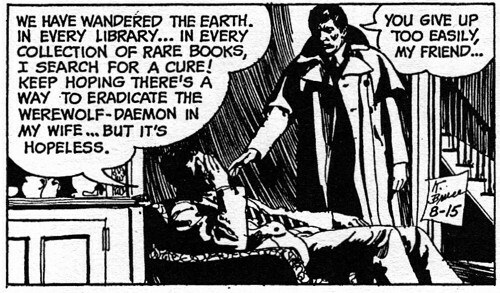 Barnabas Collins and Quentin’s Demon was published in February 1970, a little over a year before these comic strips were written, but I would hesitate to suggest that the writer of this story read the Paperback Library gothic and stole these plot ideas. I mean, it’s possible, but I just have a hard time imagining that anybody who writes for a living would be able to choke down one of the Paperback Library novels. My guess is that these are both stealing from the same source, maybe a Hammer Horror movie or an episode of The Mod Squad or something. 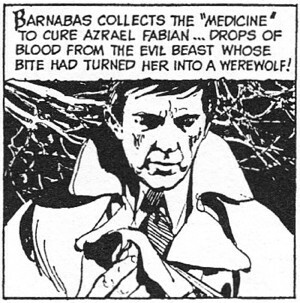 Anyway, Barnabas is convinced that Erik Fabian is a werewolf — he’s not, by the way, it’s Azrael — so he comes up with one of his famous law-breaky plans. He sends Carolyn to the library to read up on the other werewolf victims, while he breaks into the Fabians’ house with his sonic screwdriver, and rummages through their belongings. This is a standard Nancy Drew-style felony that always leads to a positive outcome. As per usual, comic strip Barnabas is guided by his magical time-saving instincts, which lead him unerringly to a locked trunk in the attic that unlocks itself as soon as Barnabas touches it. This keeps the “looking for evidence” scene down to eight panels. 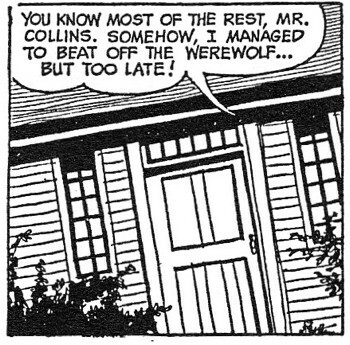 Although now that I think about it, it’s actually surprising that the Dark Shadows comic strip moves so fast, compared to what they could be doing. This is a three-panel daily strip with a six-panel Sunday, which means that you could spend weeks having the same conversation, if you’re low on material, and that’s what I would have expected from this strip. But instead, they pretty much sprint from one plot point to another, using the phrase “I sense its evil presence” to keep the boring “looking for evidence” panels to a minimum. The plot points don’t actually make any sense, but there are a lot of them, and I appreciate that. This is the actual front paw of an actual werewolf, cut off at the wrist and attached to a belt, for some gruesome reason. When Erik Fabian wears this daemonic belt, he ceases to be a human! Anyone who has been bitten by a werewolf can become a demon creature himself… by wearing this evil claw! Which means, obviously — wait, what? Barnabas mentioned earlier that if Carolyn was bitten during her encounter with the werewolf, she would have become a werewolf too; this is standard procedure, as set forth in the 1941 Universal Monsters rulebook. But according to Barnabas, getting bitten isn’t enough — you also have to wear a belt adorned with a werewolf claw. So the update from the ABC7 AccuWeather Sense Tracker goes like this: What? Also: After you’re bitten, how do you get the claw? Does it come with your daemonic onboarding kit? Do you have to cut it off the werewolf that bit you? If so: What? Didn’t you just lose a fight with that werewolf? And does that mean that a werewolf can only bite two people, at which point it loses both claws and has to go into retirement? How would you know to cut off a paw and string it around your waist? And why would you want to make a belt like that anyway, if it means you become a werewolf? To summarize: What? And then there’s the biggest puzzler of all, the reason we need a Sense Tracker in the first place: Why does Barnabas put the claw back in the trunk? I mean, it seems like the story is over at this point. Barnabas finds the claw, he throws it into a wood chipper, problem solved. It’s a trap, obviously; it’s always a trap when people tell you when their birthday is. Barnabas is just trolling the werewolf, trying to bring on an attack so that he can catch the creature in the act. I’m not even going to get into how the plan works out, but it involves Elizabeth hiding on the Fabians’ front lawn, blowing a whistle and trying to get herself killed. And hey, guess what, it turns out Erik isn’t the werewolf after all; it’s the other guest character in this story, quelle surprise. The Fabians’ door is locked, but “the locked door opens easily at Barnabas’ touch,” because he’s such a frequent trespasser that the locks of the world have collectively decided to give up. Barnabas asks Erik to explain, and dig this: Erik, Azrael and their daughter once lived in Europe — no specific place, just Europe in general — and they wandered onto the estate of Count Karoly. I don’t know what it is with comic strip people and trespassing; apparently it’s a thing. The Fabians were attacked by a werewolf, naturally, who killed the daughter and bit Azrael, which is why you should never go to Europe under any circumstances. Grieving for her daughter, Azrael did what any mother would do, namely: pick a fight with the werewolf, cut off its hand, and wear it around her waist. But that’s not the crazy part. 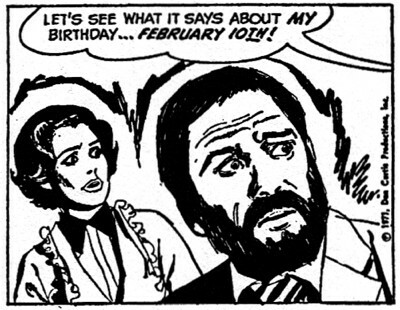 The crazy part is that the werewolf attack happened on February 10th, and that’s why Azrael targets anybody whose birthday is February 10th. I know. I know! I can’t help it, that’s what it says in the comic strip. And this was printed in the newspaper, which means it must be true. This is the way that werewolves behave. So let’s turn to the ABC7 Sense Tracker. Azrael has attacked several people in the last few weeks, and all of them were born on February 10th. How does she locate these people? Does she just wait around for somebody to walk up to her and announce their birthday? And why doesn’t Erik just take the claw away? Which means we need another ABC7 Sense Tracker update. They’re just piling up, aren’t they? The burning question is: Aren’t you the librarian? Carolyn said that you’d been working at the library for a few weeks. If you’re wandering from library to library, couldn’t you get all the information that you wanted by just visiting, without all the hassle of applying for the job? And another thing, re: efficiency. Why doesn’t Azrael actually kill her victims? She basically just knocked Carolyn over, and then ran away. Why does she have this unquenchable desire to do mild injury to Aquarians? Barnabas decides to get to the heart of things, so he travels to Europe somehow, because it’s possible for a vampire to be on a ten-hour transatlantic flight without ever being exposed to sunlight. 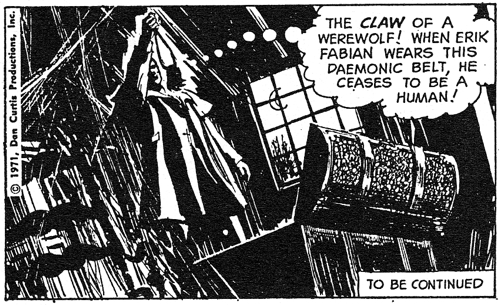 He’s come to visit the estate of Count Karoly, where the Fabians were attacked, which obviously means that Count Karoly is also a werewolf, because why would you even bother to introduce a character with a name if he isn’t a werewolf. By the way, speaking of names, try saying “Carolyn and Count Karoly are counting calories” five times. It can’t be done. 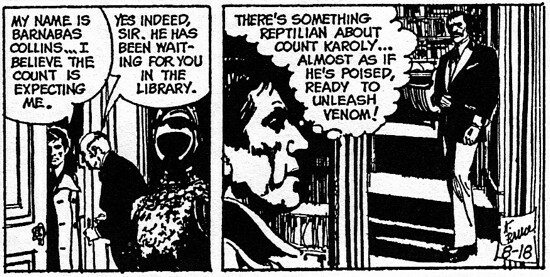 Barnabas meets the Count, who’s expecting him somehow, and he notes, “There’s something reptilian about Count Karoly… almost as if he’s poised, ready to unleash venom!” So great, now we have a weresnake too, on top of everything. So, remember that “wounded front paw” thing from Barnabas Collins and Quentin’s Demon? Because Barnabas brushes up against Karoly’s left hand, and realizes that it’s fake. 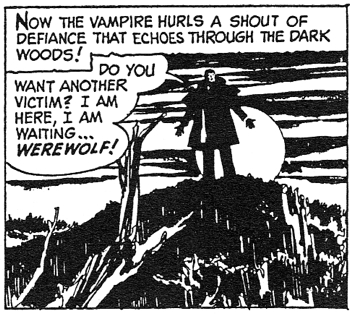 Count Karoly is the werewolf! And finally, after all these weeks, we get the Universal Monsters mash-up that we’ve been waiting for — Vampire v Werewolf: Dawn of Justice. This goes on for about a week, and it’s fantastic. So, again: What? After being bitten, Azrael went out and cut off the werewolf’s front paw. I have to imagine that drops of his blood were involved in some way. It’s like these people are trying to drive me insane. But honestly, who really cares about sense anyway? We have a scene with Barnabas fighting a lady werewolf, who’s wearing a fabulous gown. I really, really wish they’d thought of this for the television show; they never would’ve been cancelled. They could just do this every day, and the show would run for another ten years. So let’s do one last ABC7 Sense Tracker update, starting with: Never? Then why does she go out and attack people who were born on February 10th, if she’s not trying to kill them? Doesn’t that keep all the February 10th people in the pool of potential victims? Or do they get a handstamp that indicates they’ve already been werewolf-attacked, and don’t need to get attacked again? Except isn’t “living in the past” what Dark Shadows is basically all about? These stories always involve people being haunted by some dark secret from the past. 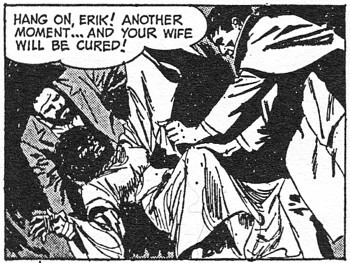 Just in the three comic strip stories we’ve read so far, we had a warlock magazine publisher still holding a grudge against the family after three centuries, and the goddess Isis reminding Barnabas that he used to be a pharaoh several millenia ago. If you don’t live in the past on this show, where are you supposed to live? And here’s the dangerous thing about this comic strip: all three stories end with somebody saying that you should forget what just happened. Barnabas told Elizabeth and Carolyn, “Try to get some rest… and forget the visit to Collinwood by Lucas Penrose Bell.” In the second story, Isis cast a spell on Barnabas: “Do not remember! Erase this night from your memory!” And now here’s Barnabas again, repeating the strip’s mantra: Try to forget. So what we have here is a comic strip in the process of unmaking itself. At the end of each chapter, there’s an invocation that erases all traces, retroactively wiping the story from existence. Once the Fabians are gone, Barnabas says, “Sometimes, Carolyn, people seem to know instinctively when it’s time to move on.” Except Dark Shadows fans, of course, who have stubbornly refused to move on for the last fifty years. Is that what this comic strip is for? Is it trying to make us forget about Dark Shadows?